Micro Processor based controller with Touch Screen Setting for speed, size digital display & count on key board. 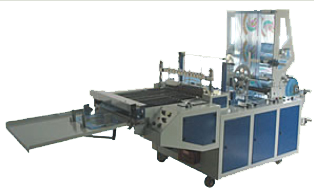 SSMECH offers Bag Making Machines with high output. we offers bag making machine with Servo motor & its control and with Mechanical Clutch & break System as per customer requirements. We are manufacturers and Exporters of Bottom Sealing Bag Making Machine and Side Sealing Bag Making Machine.